Our Bed and Breakfast is situated on 60 acres of covenented rain forest in the Colquhoun forest which you would be able to explore by foot, car or bicycle. You could wander around our property and enjoy a visit to the old log cabin l Also, there is an incredible amount of wildlife to study, such as wombats and lyre birds. Relax in the spa or sauna ,then enjoy a sumptous dinner perhaps of local seafood or forest flavors. 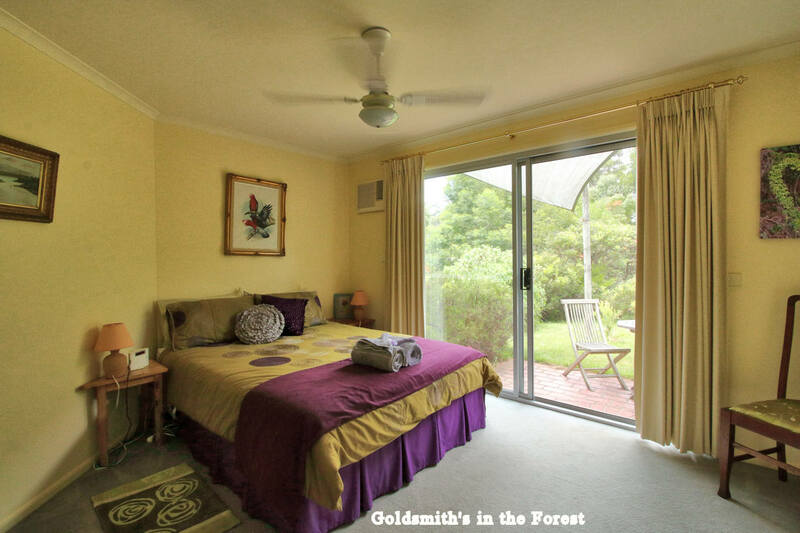 Our unique Bed and Breakfast forest retreat nestled in the forest above a rainforest gully just 10 km north of the seaside town of Lakes Entrance, and has accommodation designed so that you can enjoy our natural beauty. Facing east, this room is ideal for early risers and winter travellers. There also is a lovely view out toward the forest. Breakfast is included and dinner is available at extra cost. Stay 1 night in one of our comfortable rooms, enjoy the area, the peace including a relaxing 3 course Dinner in the evening and a lovely breakfast in the morning. The bedside tables are locally crafted from Silver Wattle. This room has its own outdoor area with the view across the water feature to the forest. Breakfast is included and dinner is available at extra cost. 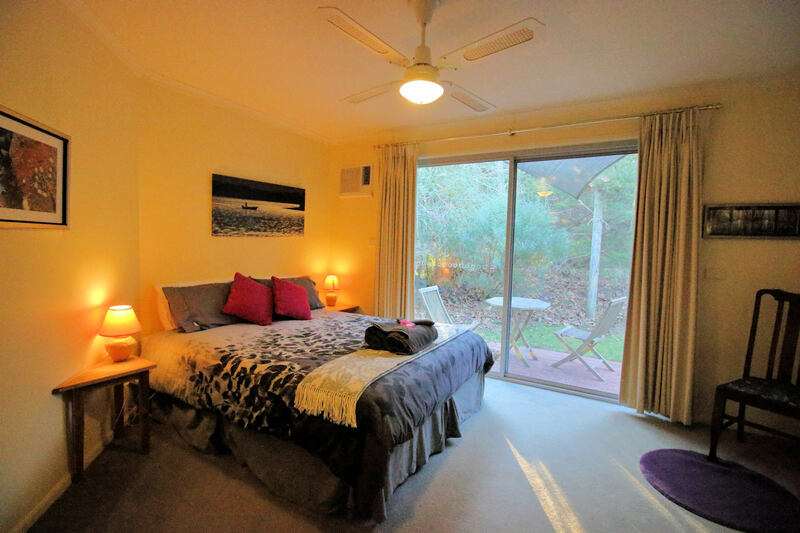 This gorgeous room contains a queen size bed, an ensuite and an air-conditioner. Breakfast is included and dinner is available at extra cost. This room contains a queen size bed and is ideal for a couple. The room contains an ensuite and air-conditioning. Breakfast is included and dinner is available at extra cost. 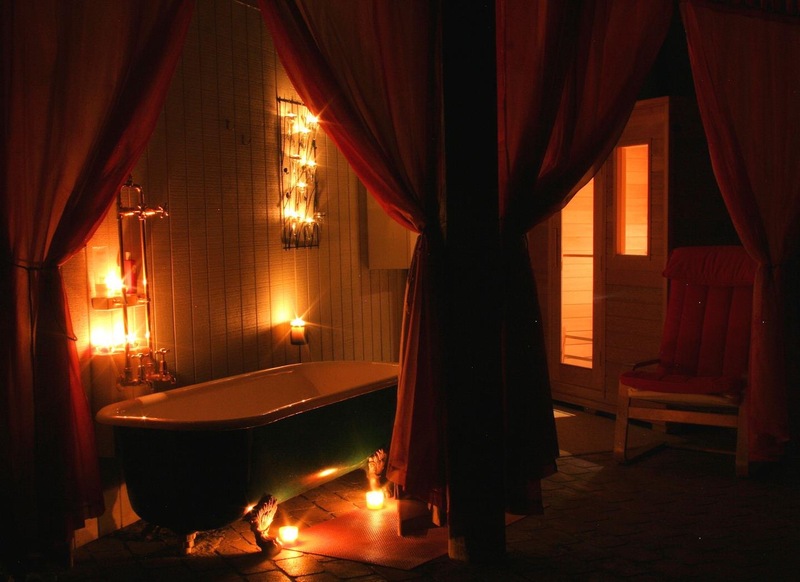 Share a Milk and Honey bath or a sauna using some of our fragrant oils in the fernery. Stroll around the property, relax in the gardens settle back in the fernery or the window seat. There are many places to enjoy your time together alone. If you are lucky enough to come in winter theres always a wood fire to curl up by. You can enjoy your romantic weekend retreat without the need to venture beyond the property at all.